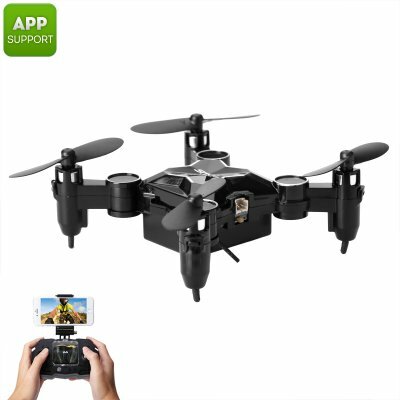 Successfully Added SMAO M1HS Mini Drone - 0.3MP Camera, FPV, App Support, WiFi, One Key Landing And Take Off, LED Lights, 220mAh (Black) to your Shopping Cart. Packed within the miniature body of this beautiful drone lays hidden a sophisticated 0.3MP camera that is fit for snapping pictures and shooting video from the skies – allowing you to discover your surroundings like never before. Thanks to its mobile app, WiFi, and FPS support, this video drone is compatible with both Android and iOS smartphones and you will be able to enjoy live footage from your drone on your phone’s display while flying through the skies. To make the usage of this drone as convenient as possible, the included remote control comes with an efficient smartphone stand that can be used to attach your cell phone to the remote. Equipped with a lightweight yet powerful 220mAh battery, this miniature 6 axis drone is capable of flying up to 7 minutes continuously. With its 100m control distance, you will be able to fly large distances without losing control of your drone and its built-in LED lights will assure that you’ll never lose track of your mini-drone while in-flight. Additionally, this compact drone comes packed with numerous in-flight features such as 3D flip support – allowing you to take the most out of this affordable drone and experience hours worth of pilot fun. Perfect for young and beginning drone pilots, or for those of you that simply like to enjoy hours worth of drone fun at an affordable price - the SMAO M1HS Mini Drone surely brings along great entertainment. With its intergraded camera, FPV support, and WiFi connectivity, you will be able to conquer the skies and experience your neighborhood like never before.